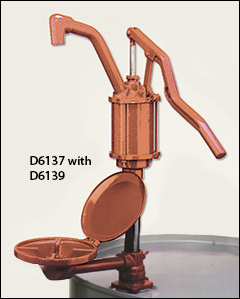 Drum pumps, hand pumps, barrel pumps, manual pumps, non-sparking drum pumps, rotary pumps, lever pumps, self priming pumps. Wesco iron drum pumps with wetted parts fabricated from cast iron, steel, phenolic (D6130 and D6131 rotary pumps) and neoprene (D6137 lever pump) materials. Designed primarily for the transfer of fuel oil products. These drum pumps can only be used for chemicals which are compatible with cast iron, steel, neoprene and phenolic. It is recommended that if a question arises, the user should contact the supplier of the chemicals to determine if these drum pumps are compatible with those chemicals. Additional drum equipment is available on our Cradles, dolly, lifters , Drum and pail heaters , Drum deheaders, funnels , Faucets , and Faucets for flammables pages. Wesco rugged cast iron construction. 47" 3 piece plated suction tube shipped assembled. Durable phenolic veins. A self-priming drum pump supplied with 48" PVC discharge tube. Available with or without a drip pan assembly. Wesco rugged aluminum construction. 47" 3 piece plated suction tube shipped assembled. Durable phenolic veins. A self-priming drum pump supplied with 48" PVC discharge tube. For medium viscosity petroleum based products. 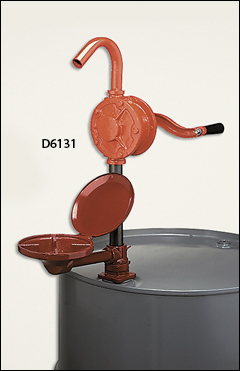 Wesco rugged cast iron and steel construction will pump one pint per stroke. The 47" 3 piece plated suction tube is shipped assembled. A self-priming lever drum pump with neoprene seals. Drip pan listed below can be used on this pump. for installation on drum pumps with metal suction tubes. Hinged cover and bung/suction adapter. Cast iron and steel construction.